Wood Carving is normally done with chisels and wood by artists. There are four different techniques for Wood Carving and each of the techniques use different kinds of tools for creating the sculptures. Whittling is a very old method which has been use for many years. In this technique the knife strokes are visible if you look at the carving closely. Carving in the round: In this technique many different tools like gauges, chisels, knife, blades etc are used to create the wood carving. The end result of this wood carving will be very smooth and life like. Relief carving is making 3d images on wood. It is normally done on a flat piece of wood and used as decorative pieces on walls. Chip carving requires chip knives which are used to create intricate designs. Many abstract designs, geometric patterns can be created using this technique. 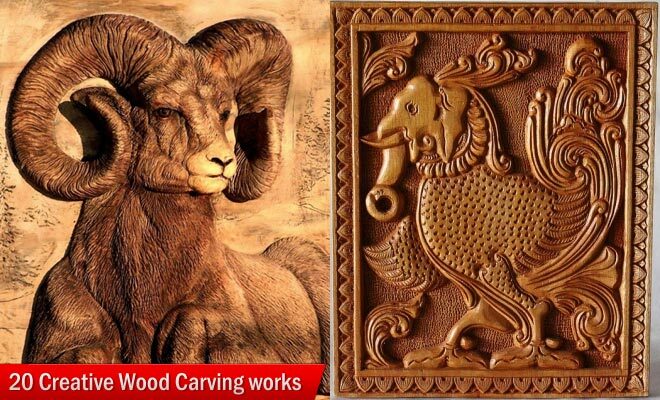 In this post we have added 20 Amazing Wood Carving designs from around the world for your inspiration.